Pawan Chhetri from Jorhat, Assam became the 9th Garnier Men Mega Mister North East 2018. Besides, Mitrayan de Sarkar from Agartala, Tripura and Hirok Jyoti Kalita from Tezpur, Assam became the 1st and 2nd runners up respectively. The show was held at the ITA Cultural Complex, Machkhowa on Friday evening. 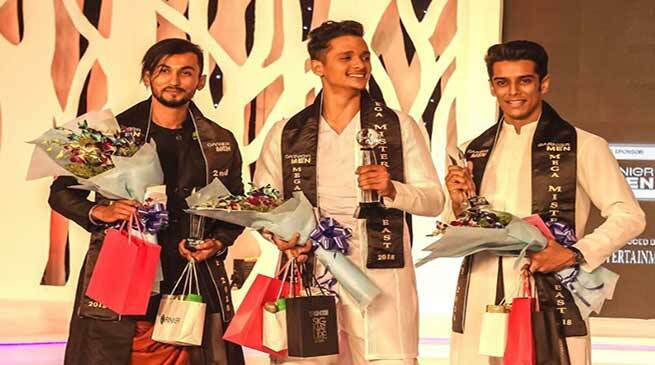 Mega Mister North East is the biggest manhunt of northeast India, which has been conceptualised by leading fashion entrepreneur Abhijit Singha. The grand finale of the 9th edition witnessed the participation of 48 contestants, who travelled to Guwahati for almost a week of activities which included grooming and training sessions conducted by Contestant Directors Piyush Sharma and Dipankar Buragohain. Jorhat-born Pawan Chhetri is a fitness trainer at Jorhat. A graduate from CKB Commerce College, 21-year-old Pawan thanked everyone for the support and said that the title will enable him to live up his dreams. “I heard about this manhunt from one of the ex-winners and thought about trying out my luck here. I just wanted to take back some wonderful memories and great experience. I never expected to become the winner of this contest. He wins a prize package worth approximately Rs. 5,00,000, including a cash prize of Rs. 1,00,000, and lots of gift hampers. Hirok Jyoti Kalita, who is a fitness trainer based at Tezpur, was the second Runner’s up at the 9th Garnier Men Mega Mister North East 2018. “I am speechless! I was greatly inspired by the 2013 winner Piyush Sharma. Ever since he won, I wanted to participate in this event and hence, I started preparing myself for this contest. I am so glad that my hard work finally paid off,” he said.